"A corrupt party leader corrupts the entire structure of the party," Justice Ijaz ul Ahsan remarked during the day's proceedings. "A disqualified individual can gather 10 people, form a party and then use them [to further his agenda]," he remarked. Turning to Salman Akram Raja, who was in court pleading disqualified former prime minister Nawaz Sharif's case that disqualification from parliament should not deprive an individual from leading a political party, the judge said: "Qualified people are being controlled by a disqualified person." "How can a person who has been punished [and disqualified] lead a party?" the judge asked Raja. 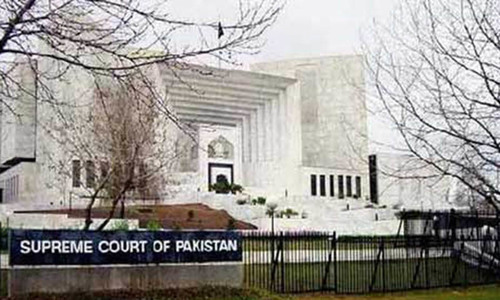 However, Raja disagreed with Justice Ahsan's assessment, arguing: "The issuance of Senate tickets by a disqualified individual does not corrupt the entire party. A disqualified person cannot come to parliament, but he can run the party." "[By that logic,] can a dacoit and the ringleader of a drug mafia or a person involved in serious crimes also become the leader of a political party?" the chief justice asked rhetorically. Raja told the court that anti-apartheid revolutionary Nelson Mandela had also spent 27 years in jail, implying that his incarceration did not affect his ability to become the African National Congress and South Africa's president. "Those cases on Mandela were political, not criminal," Justice Nisar reminded the counsel. 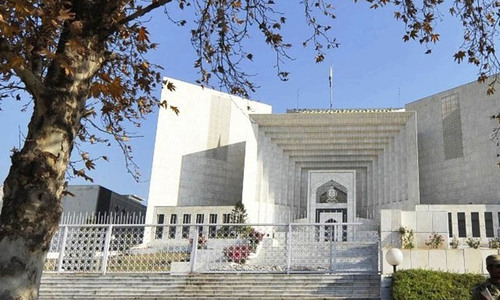 Referring to Sharif's alleged contemptuous statements, the chief justice said: "Can an individual who has insulted the court become the president of a political party? Anyone who issues contemptuous statements cannot be loyal to the state." The chief justice, however, told Raja: "Your party may have some good people. We are not imposing Article 6 on you." The case's hearing was adjourned till February 21. Corrupt lawyers defend corrupt politicians. They must also be held accountable. a disqualified person should not be allowed to be head of the party. Each of our major parties talk cue from their leaders and this is why corruption prevails. Convicted person if allowed as party leader means thst we allow DON system of Mafia world legally. A disqualified person CAN lead a political party because it is not a public office paid for by the tax-payer. Unfortunately, this is not the right time to hear and plead this case. Emotions could probably overcome the wisdom. The disqualification of NS is fresh in the minds and it may have a decisive impact on arguments and decision making. I wish if the case is adjourned for some time. The SC should not waste time in hearing such arguments - a criminal is a criminal, he can not and should not have anything to do with affairs of the public. Why are we even debating about a party leader being corrupt and still holding political office? In no democracy would a corrupt politician be allowed to be party leader, or influence politics in the country. The Supreme Court provided Nawaz Sharif an opportunity to prove the source of his massive overseas wealth? He failed to do so as it was acquired by corruption. He must be barred from politics for life and sent to jail. No politician or his family can be above the law. Salam Sir: I think when a person who takes over control from a civilian ruler, and is accepted as Chief Executive of the country, without popular mandate, running a party without being a member of parliament should be OK! @Javed it is as 'public' as anything out there is. Why? It is not private, i.e., owned by someone, e.g. family. In all fairness, it deals with or is meant to deal with issues related to and of public at large, such as governance, handling of funds, policy making, raising funds, etc. Politics cannot be and never is private. "[By this logic,] can a dacoit and the ringleader of a drug mafia or a person involved in serious crimes can also become the leader of a political party?" This is a general statement. Nowhere it implies a specific person. It is unfortunate that this general question asked of the lawyer to probe perimeters of the scenario in front of the SC is being deliberately misconstrued. Instead a criminal should behind the bars, his status is argued to be heading a party or not- no complexion, a straightforward case , he should be disqualified for ever and should be in jail for lesson for others. @Shahid agreed - to me unfortunately even the highly respected SC and its Judges are not using appropriate language knowing their statements are published in news papers! Let us restrain and save the august institution such as SC and by the same token the Judges. Let us not make things so difficult that we cannot return back to normal. CJP questions and remarks are 100% right. And today people wish to see the Sharifs family on ECL. Suppose a person is disqualified from party head. Even then depending on the personality and support that person can still influence all selections. So it does not make sense to either disqualify for life or to prevent someone from being a party head. although time periods can certainly be specified. But that is for the parliament not the courts to do. 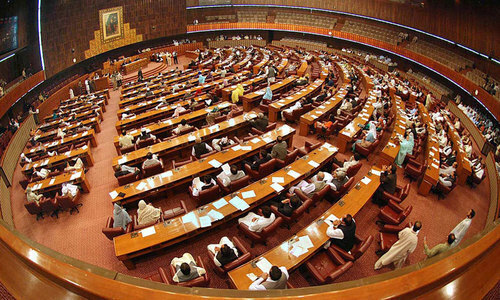 A person who is not Sadiq and Amin is not forfilling the SPIRIT of the Constitutional Article 62-62, therefore, he cannot lead any Parlimentarian. Period. Our constitution give the guidence for qualification of members of parliaments and same is applied for political party leadership. Changing any law just for the sake of any individual is bad intention and therefore should strike down. The judges are showing too little faith in the democratic system and judgement of the people. In the process they themselves are undermining the democracy. A corrupt politician in a position of power and influence can corrupt the entire nation and destroy the society. @James well said. I second your comment. The nation is suffering because of such comprises and providing space to criminal to play with the destiny of the nation. This must end at some place. NS stay party leader or not, he will still be leading the party anyway. Punishments from the court try to purify the society, if a convict from court is allowed to head a party he will negate this principal. Depending on one person in a party is not good for the party, I am sure there are competent and honest persons in PML they should be given chance to lead the party. Gentlemen time has come to make the select group of elites' in this country accountable, they look down upon the general public, have a sense of superiority, their actions have gone unaccounted for far too long that they cant decipher this entire accountability process that has started courtesy panama leaks, finally Supreme Court is doing what it should have done long time ago, take these crooks to task. How a dishonest person can select honest person? ? Corrupt people breed corrupt leaders. Corrupt top leadership encourages the subordinates down the line to follow the corrupt practices. Catch the DON and make a lesson for all to shun corruption. It’s high time to get rid of corruption in Pakistan .The land of the pure, that’s what the word Pakistan means. @zafars agreed. Look we also accepted and honored those who decided to set a side constitution and the elected parliaments. If they were acceptable as good ruler, with the same token a person, not declaring salary, which he never received, cannot be condemned. He has the rights as any other citizen, and he cannot be considered criminal nor someone who took away rights of others! Even Raja would have difficulty understanding what he is saying. The Justice gave good rebuttals. A corrupt party leader corrupts the entire structure of the party," Honorable judge, not only that, it promotes corruption in the entire country. These leaders must look in the mirror before speaking against the Supreme court and the CJP, now that the courts are coming down hard on corruption, they have no where to go but to disrespect the laws.What goes around comes around. Why our public still not hearing the truth? @Shahid why do all of you keep writing the same things? im not sure of the point to it? Actually corrupt the entire nation because everybody feels that if top man can do so can they . Can the Pious Judges explain that what if disqualified person is in fact innocent ? Then what ? Also the ones passing judgement might in fact be corrupt themselves and might have violated constitution in past. Then what is the remedy ? We are asking, why they are not yet in jail. The judges are required to give impersonal, non-rhetorical, non-partisan and objective statements and interpret constitution accordingly. Is it the case? Single rotten fish polluted the whole pond. @Faisal Why not held accountable 10 M people who voted PML N (NS) to power? Judges are biased it seems from their remarks. If party worker chooses NS as their leader it is their right. IK should convince people not to vote for such leaders. Judges and IK cannot impose their will and wish to people who they elect.? It’s very obvious that some folks are abusing and misusing their positions of authority by carrying out personal vendettas without caring about the damage their unhinged actions are doing to the honorable system they represent. Unfortunately, this must be the darkest period in the history of Pakistan’s judiciary. How is not the question for honorable justices to ask. There is a law passed by the parliament that allows such a person to be party leader. If the law that was passed was unconstitutional, then justices have the authority to strike it down. Otherwise, the justices need to follow the laws created by the lawmakers in parliament, whether the justices like it personally or not. They have no authority to question the morality of the law. Much as I detest NS and his corrupt family, Raja is correct when he says a conviction is made according to a law relating to a particular offense, and cannot taje away all of an individual's rights. A convict sent to jail has his freedom to move about freely reatricted. He cannot be deprived of food, air, water etc.because he has been convicted. It is for right thinking members of society to shun such a person and to avoid voting for anyone nominated by such a person. Whether in the absence of such a consciousness the courts can become arbiter of what right-thinking people should do, and act upon that, is doubtful. @Imran Sheikh - you are so wrong and missing the whole point. NS is disqualified for being dishonest. He is influencing people because he has boats loads of money. How a corrupt person be trusted to pick members for parliament? May be in your books only.